President Petro Poroshenko has said years passed and after the terrible World War II new generations of freedom-loving Ukrainians were born, who were lucky enough to live and work already in an independent Ukrainian state. "And, just as in the 1930s and 1940s, when our ancestors defended the country from the Nazi invasion, we protect our glorious Ukraine from the Moscow horde today. 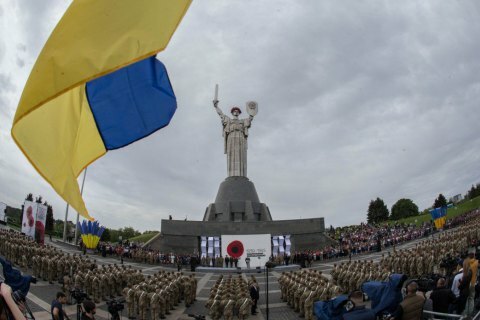 We bow our heads to the memory of heroes who performed their military duty, remained loyal to the oath until the last breath and gave their lives to Ukraine," he said. The head of state remarked that the memory of the enormous human sacrifices of World War II, thousands of ruined cities and burnt villages once again warns the world of the danger of repeating such a disaster. “Unfortunately, there are still maniacs ready to put the world on the verge of the third world war. They are here, not far, that is why we must be vigilant and responsible,” the president said. The Head of State reminded that Stalin's Soviet Union during the first two years of World War II was an ally of Hitler's Germany. "The war, which the USSR unleashed against Finland, the annexation and occupation of Latvia, Lithuania and Estonia were the same examples of aggressive actions that the Nazi regime did in Europe before sending weapons against the former eastern ally. The nations of the Soviet Union, including us, Ukrainians, paid a very high and terrible price for this," he said. "Today, Putin's Russia has again embarked on gross negligence of the norms of international law, destruction of the world order, non-recognition of borders, denial of the existence of the whole nations and aggression against the neighboring states. I am convinced that by joint efforts we will win, overcome the aggressor and secure peace," Petro Poroshenko emphasized. The president congratulated Ukrainians on the Day of Victory over Nazism in World War II.